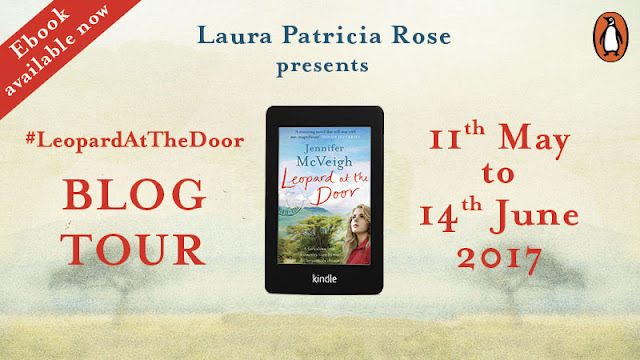 I am delighted today to be finishing the tour for Leopard at the Door, another stunning novel by Jennifer McVeigh and I am so excited to share my review with you. Jennifer McVeigh captivated me when I read her debut The Fever Tree back in 2013. She instantly transported me to 1880 South Africa and now she is back with another memorising novel, Leopard at the Door. Leopard at the Door brings us back to South Africa, but this time set in 1950's Kenya which focuses on Rachel. Rachel has not been in Africa for 6 years following the death of her Mother. She has longed to return but she quickly comes to realise that the Africa she left behind is not the same as it once was. Jennifer's words and descriptions of South Africa are almost hypnotising, I have never been so transported to a time and place as much by an author. Her writing is lyrical and evocative, so much so that when I did book the book down, it took me a few moments to gather my bearings. It was incredibly atmospheric, I have not read a book quite like it since her debut. Each time Jennifer has enlightened me to the history of a country which I know very little about. I have entranced but also shocked and saddened at the treatment of the African's in this tumultuous environment. There were some very hard hitting scenes, so I will pre-warn those about that, but it was there to heighten exactly what went on during the Mau Mau rebellion and the huge sense of injustice. Another lyrical, atmospheric and just stunning novel.